Vitamin B12 deficiency is known as an elderly disease. Macrocytic anemia is commonly used as a diagnostic criterion for B-12 deficiency. I. Prevalence of low (serum B12 <148 pmol/L) and low-normal B12 status (148-221 pmol/L) was calculated from data collected at Star-MDC (2010-2013) in a undiagnosed patient population (Rotterdam NL, n=161,548). II. Macrocytic anemia (MCV>100 fL; Hb<7.5 mmol/L women, Hb<8.5 men) was assessed in relation to low B12 and low serum folate (<6.8 nmol/L) in a subsample of 59,231 individuals. I. High prevalence of low and low-normal B-12 was found in the overall population (24.3% and 34.3%, respectively, total=58.6%) and was consistently high between genders and across years of collection. Children ≤10y presented a lower prevalence (p<0.0001) of low and low-normal B-12 (11.6%) than adolescents (10-20y, 50.8%), adults (20-65y, 58.7%) and the elderly (>65y, 60.2%). II. The overall subsample presented 24.7% low B-12, 8.1% low folate, 22.2% anemia and 3.7% macrocytosis, 1.3% macrocytic anemia. When B-12 was low (p<0.0001) only 1.9% presented macrocytic anemia vs.15.6% when folate was low. 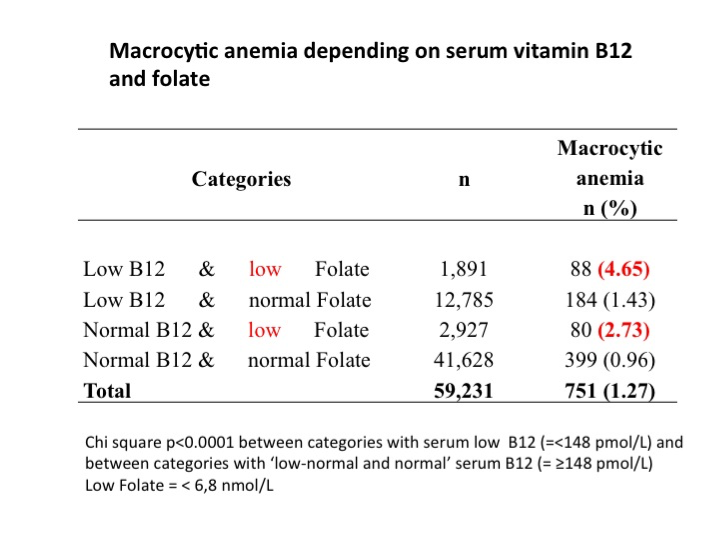 Categories of low and normal B-12 with low folate presented higher prevalence (p<0.0001) of macrocytic anemia (4.65% and 2.73%, respectively) than those with normal folate (1.43% and 0.96%). 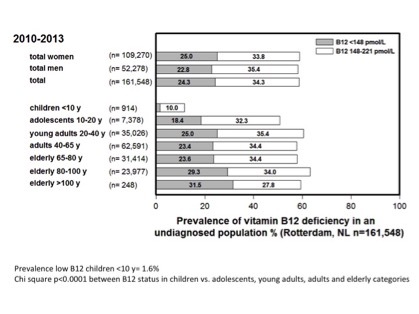 Low and low-normal B12 were highly prevalent across age groups. Macrocytic anemia was low and was mainly explained by low folate. This suggests that B-12 deficiency is not limited to the elderly and that macrocytic anemia is a poor indicator of B12 and folate deficiency.